The Classroom Child Theme by Obox is an official child theme for Layers designed for modern, full-featured educational websites. Visit the page you want to edit and click Edit Layout or from the front-end, click Customize in the admin bar. Click Edit Layout in the Customizer menu to expand the widget panel. 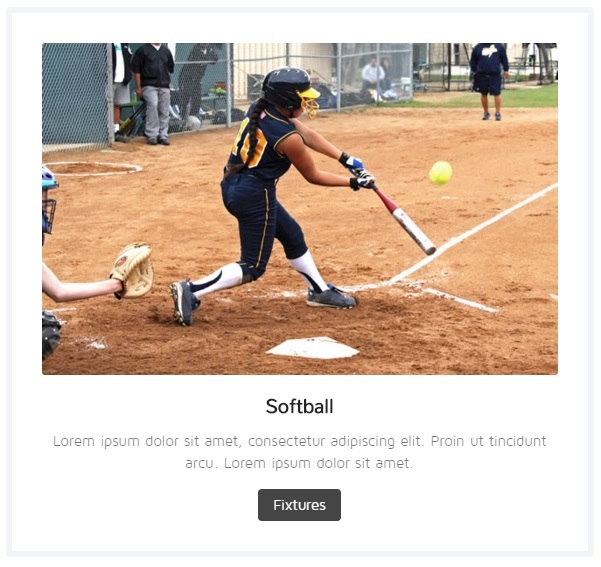 When you add a new Content widget, or if you have created a page using one of the Preset layouts, the widget will display some default settings and content, and have three column panels by default. The design bar on the right side of the widget controls the overall style and layout for the widget. Boxed will limit the width of the widget’s content. As such, the columns also become narrower. The gutter option controls the margins/spacing between blocks. Uncheck it to remove spacing. Classroom features a handful of pre-built custom classes you can add to the Custom Class field of any Content Widget to replicate effects seen in some of the preset pages. Class names outlined at the end of this guide can be placed into the Custom Classes field of this Advanced option without any further CSS. You may enter a title and short description here, if desired, or leave this section blank. The Description field, containing “Our services run deep and are backed by over ten years of experience.” by default, includes rich text editing and supports basic HTML input via the Code view, much like the WordPress editor. The most common use is to enter a short excerpt of 1-3 sentences to introduce the following content. This field may optionally be left blank. The widget options bar is something you will see in most Layers widgets. These menus give you detailed control over the content of the widget, much like the WordPress post editor. The column menu sets the width of this specific column based on what percentage of the total it is. This takes a little bit of basic math. You must essentially take the number of columns blocks you have, and determine how many you want on each row. From there, you must divide the number of Layer columns each takes up to end up with a total of 12 or less. The grid in Layers has 12 possible columns. For one column block to span the full width of the page, you would choose 12 of 12 columns, which is equal to 100%. To get an offset look with two column blocks, you could choose 9 of 12 columns for one and 3 of 12 for the other. You can mix and match these, and create rows with varying width blocks. View the Layers Grids page for a visual guide to how grids work and how you might combine them for different layouts. This sets the heading in each column block and may optionally be left blank. What kind of HTML works best in rich-text fields? The text fields have a <> button that activates the code view, similar to the Text tab of your post editor. You can use this view to add or edit the HTML of your content. or icon fonts. We do not recommend adding structural elements such as sections, headers, footers or asides etc. Each field is optional. If left blank, it will not appear. Enter the location. This can be a venue, city, or address. Click the menu icon at top-left and choose Share or Embed Map. Click Preview Actual Size and adjust the height and width to your desired size to fit the column in your widget. 300×200 is a good starting point. Copy the embed code and paste it into the Place field. The Button Text field creates a button. The Button URL field links the button, column title and image. Button Text must have a Button URL for the button to be visible, but a Button URL may be added without Button Text if you only want to link the column Title and Featured Image to your link and not display a button. To add more column blocks, simply click the +ADD NEW EVENT bar. This will duplicate your last column block to help speed up customization. To delete a column block, click the pencil icon in the right corner of the column’s title bar to expand it, then click the red trash-can icon. The Classroom demo uses the StoreKit extension for the menu cart and product widgets demo’s Shop pages, which require WooCommerce to be installed and configured first. This step is optional if you awant to setup an online store. Stores are a wonderful addition to educational sites and can be used for sale of supplies, text books, seminars, courses ticklets or anything you can think of! Layers themes use Presets instead of traditional demo content that you load via an XML, but we do provide this file if you want to rapidly setup a copy of our demo site, and is found inside the Themeforest zip package. Note that this will add over 10 pages which can significantly slow your Customizer! The XML also will not setup widgets, customizer settings or plugins, it will only auto-load posts, products and images. 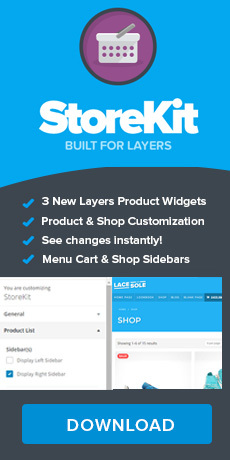 The Shop Page demo uses the StoreKit product widgets, which grab Product posts by ID. You will need to configure the widgets with your own product post content, as IDs are unique to each WordPress install and will not carry over in demo content. WooCommerce offers some starter product content to populate your store and give you an idea of how products are put together. See the Importing WooCommerce Content for details and how to load it into WordPress. The following custom classes can be used in the Content Widget Advanced Options to apply special styling to that widget’s content. To see what settings the demo widgets use with each, reference the widget specified in the associated Preset pages noted below. As seen on the Cafeteria Preset, this custom class will center text horizontally and vertically inside the block and is best used in combination with the full width layout with no gutter, where the “featured image” is actually a column of its own, with no text, proceeding or following this column. Adds a padded frame border around each column, as seen on the Athletics Preset. This is best used in combination with the gutter option enabled. Styles any bulleted list created in the Content Widget column’s excerpt field using the list button on the toolbar as seen on the Transport Preset. This custom class can be used with Content Widgets to add additional padding and rounded corners to each column for use with background textures. In the Home page preset and our Demo homepage, we added four columns to the widget, each 3/12 wide. The first column has only a title and excerpt. The next three get a background image, featured image, title and excerpt, with the featured image being the 98% heading – you can substitute with testimonial avatars, icons or your own small heading images for a similar effect. Allows you to use the Slider Widget as a Call To Action Banner, as outlined in our How to Create a Call to Action Banner tutorial. 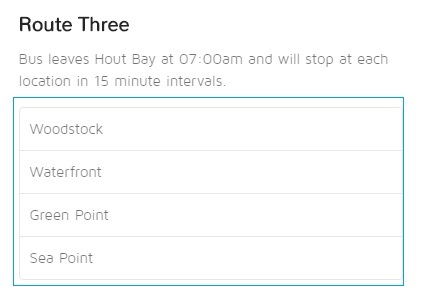 This style is best used on sliders with one slide that have a title, button link and button text. You may use boxed or full width layouts and add a slide background color or texture. As seen on the Classroom home page Preset and demo, we set the Slider Height in the Design Bar to 100px and use the left-aligned text option in the slide content. The following extensions greatly enhance Layers in general and can help you turn Classroom into anything.